Welcome! This is mixing 101 for those first time mixers. It's not as hard as you think, don't worry. First off is Audacity. It's a very basic, very free, and very helpful program. This is what you can use to do basic recording and mixing. F. Volume- This changes your entire computer's volume. L. Volume of the channel up or down. Now here's a little bit on recording. You can press record, press play on your music player, and sing along to the instrumental. But a better way is to record just your vocals and add it to the instrumental by mixing. Plug in headphones and sing along to the mp3 (you don't need to sing to an instrumental). All that is recorded is your voice. Then match it up against the instrumental and voila! A better recording. This way you can adjust the volume of your vocals to the song, things sound more clear, and you can even go in and fix little mistakes in your vocals. So! I'm sure I don't really have to teach you how to press the big red record button. Here's what you do after you have your vocals recorded. You'll notice that on your vocal channel there aren't always bumpy parts. The flat lines are when you aren't singing. As you listen back to your recording (by pressing play of course), you might notice that you sneezed or you sang where you weren't supposed to. You don't really want that on your final product, right? Take the selection tool and select that section. It works exactly like selecting text. When what you want is selected go to "Generate" "Silence..." and click "Generate Silence". Ignore the numbers. You'll notice that you'll get an entirely flat line. Play it back and you won't hear anything at all. Some people choose to do this to every part there isn't vocals, but it's up to you. *Note: The selection tool shows up as a line where ever you click on your channel. When you press play, it'll start there. Pressing the to the beginning/to the end tools will move it to the beginning/end. Now the actual mixing. Up at the top, press "Project" then "Import Audio". Choose the instrumental to the song you just sang. It'll load and you'll have two tracks. One is your vocals, and one is the instrumental. This is where the Time Shift tool comes in. It's the tool with the double arrows. You need to click on it so that it's "sunken in" and selected. The selection tool is what's chosen by default. On your vocal channel, click, hold down, and drag left or right. This moves the channel left or right. That way you can line it up to the instrumental. If you recorded your singing all the way through without stopping, things sound line up pretty well. All the silences will line up and your singing will line up once you move it into position. If you listen along and something gets messed up towards the end (it's lined up in the beginning but not later), it's an easy fix of selecting and deleting silence if you're late and copy and pasting silence if you're too early. Once you're happy with what you hear, you can make it into an mp3. But first! Make sure you checked the vocal volume compared to the instrumental. It's no good to have an overpowering instrumental and we can't hear you! Now, go to "File" "Export mp3". It'll tell you need the LAME mp3 Encoder. There are instructions on downloading it here. Make sure!!! You put it somewhere you can find it again. Once audacity finds the LAME it won't ask you again. But if you move it from that folder it'll ask for it again. So... I guess that's pretty much it! Of course, this is the basic way to mix. It's not the best. A more professional sounding way involves more intense mixing programs like Cool Edit, 20 minute vocal files (with parts sung three or four times over), audio editing to get rid of the fuzzies, LOTS of moving things around, and a human sacrifice or two. Just the voice can be done with Virtual DJ. Although it's a paid program, it works incredibly well at creating instrumentals and voice-only versions. If you have the instrumental, you can use Utagoe. You can google it. It pretty much does everything for you, but, unless you know Japanese/nonsensical Unicode, you may need a guide. Does anyone know if Audacity will record from a USB microphone or source? If anyone knows, it'd save me the trouble, but I've been looking for a good, free recording program that supports USB input. 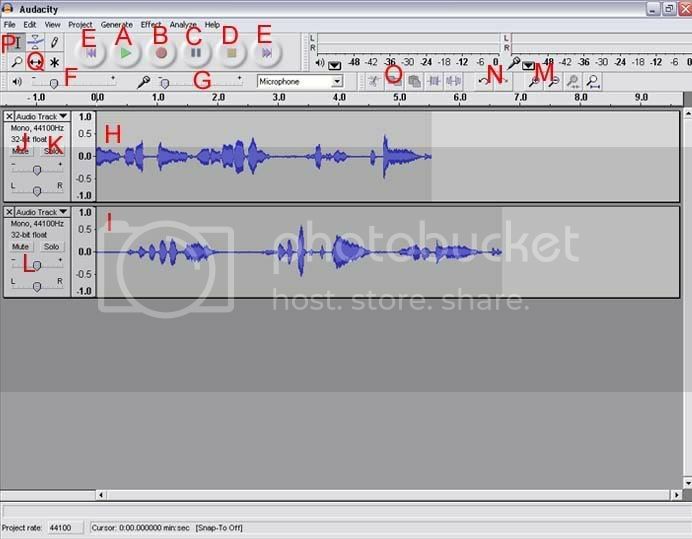 Does anyone know if Audacity will record from a USB microphone or source? I have a Logitech USB headset, and Windows installs it as a separate audio device. Audacity does see it and will allow you to use it for recording. It does. I use the Rock Band Logitech microphone for my recordings, and it runs really well.! There is a small delay, but that's easily fixed by removing some delay. HELP ME! Every time i open the mp3 of Aishite Aishite Ato Ippun into audacity it suddenly makes it louder and drops the pitch! but the mp3 works fine with itunes! I did it again this time with the Kimagure Princess instrumental! Edited by ArisaElizabethGold, 06 November 2009 - 11:28 PM. Sounds like your sound card and/or drivers. Re-install the drivers for your sound card and restart. Has Audacity always done this on that computer or did it just start? It just started, and it worked fine with the regular version of Kimagure Princess. Also i just have to increase the speed by 100 and it gets back to normal. just have to remember not to hit Ctrl + z to much when i get rid of my vocal recordings. Ummm, now i'm having problems with the save feature. It splits the audio into about 20 files and in no particular order names them like B00169 and stuff like that. How do i reopen something that i've saved and not have to reorginize it and hope that the whole recording is still there? Hasn't changed for me at all.